Just as Andrew helped businesses on Facebook connect with the people that will love their business, he'll help the businesses on Koble connect with other companies that will love their business. Koble, a business-to-business matchmaking platform, appointed Jacqueline Chin as Head of Marketing, and Andrew Federici as Head of Products, to aid in its quest to make finding new business faster, easier and cheaper for small and medium-sized enterprises (SMEs) around the world. As Head of Marketing, Chin will oversee all operational marketing activities. Specifically, she will focus on increasing engagement with existing users and driving acquisition of new customers. Chin will work out of Kuala Lumpur, Malaysia, a key market that Koble expanded into in September through its partnership with Celcom Axiata Bhd. Chin joins Koble after working for nine years at Data Synergo Sdn Bhd, a provider of marketing services in Malaysia that she started herself. During her near-decade in growing the company, she worked closely with Fortune 500 technology companies on their demand generation and marketing activities. Chin has also worked at PriMetrica Asia Pacific (M) Sdn Bhd, OgilvyOne Sdn Bhd, and Marcus Evans (M) Sdn Bhd. Federici, an award-winning, internet pioneer, will serve as Koble’s Head of Products. Based in Palo Alto, California, he will be focused on expanding traffic growth for the Koble platform. Federici most recently served as Head of Web Strategy for Facebook Business. In this position, he architected and launched a new business web presence for Facebook’s family of apps and services, including Facebook, Instagram, Messenger, WhatsApp, and Workplace. During his time at Facebook, there was a net increase in traffic from 15 percent to 70 percent across the integrated properties and significant increases in ad creation. Federici has also worked for Scoop.it, Hightail, Affinion Group, MTV Networks, IAC, AOL, and Sony Pictures Entertainment. Chin attended Universiti Sains Malaysia, where she graduated with honors in management, and majored in marketing with a minor in mass communications. Federici graduated from the University of Maryland with an MBA in Marketing. He received a BA in English and Creative Writing from Haverford College. Unlike existing professional networks designed solely for building personal brands, Koble combines the power of social networking with the intelligence of anonymous and AI-powered matchmaking to enable SMEs to focus on discovering, connecting and facilitating business deals with clients and buyers around the world. The Koble platform is currently used by professionals working with GE, Oracle, Harley Davidson, AXA, Sprint, Carlsberg and thousands of SMEs seeking to do business globally. 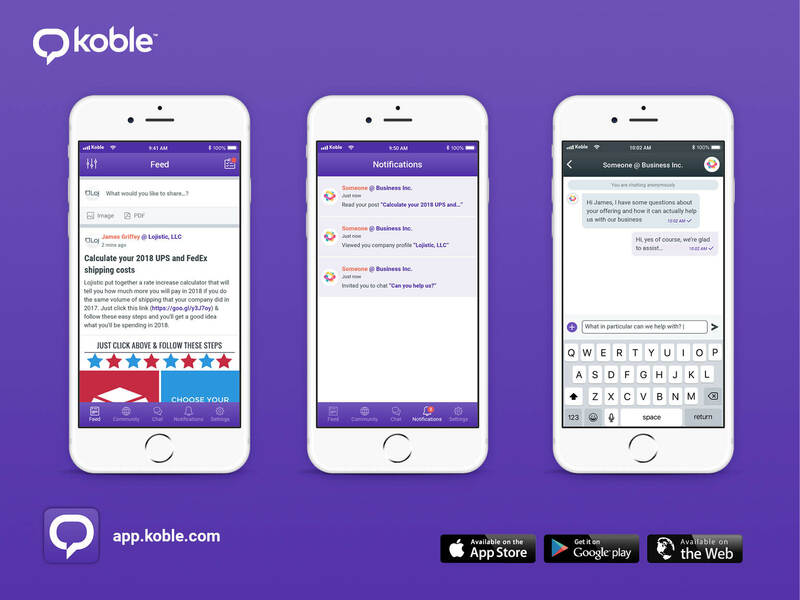 Join the Koble business community online at Koble.com, or through the Koble app available for free iTunes App Store and the Google Play Store. Koble is a business-to-business (B2B) matchmaking platform that makes finding new business faster, easier and cheaper for small and medium-sized enterprises (SME’s) around the world. Matches between business buyers and sellers are created through the Koble platform and the Koble mobile application when a user shows interest in another user or by viewing a company profile page. By improving upon current B2B social networks and platforms that are designed solely for building personal brands, businesses on Koble see message response rates twice as high as the response rates on other professional networks and click-through rates more than five times the industry average. Koble is headquartered in Boston. To learn how Koble can help you make more valuable business connections, visit http://www.koble.com.